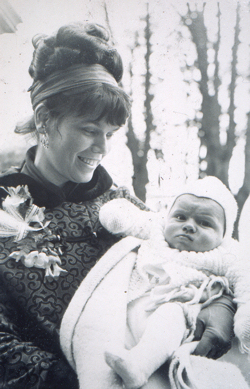 My Mum holding me in early 1972. Scanned from a positive film. There’s a scene in the film Bruce Almighty where Bruce’s girlfriend complains that Bruce has no interest in her current relationship-oriented project of collating an album of shared photographs. Well that very same project was what Jane and I got up to yesterday … only it was our photos we used not ones of Jim Carey and Jennifer Aniston. Over the course of far-too-many-hours we sorted through two filled-to-overflowing filing boxes of photographs and firmly filed more than half of them away in photograph albums (Boots have a two-for-one offer on just now). We’ve still got about 800 photos left to album-ize, but at least most of them are now sorted. 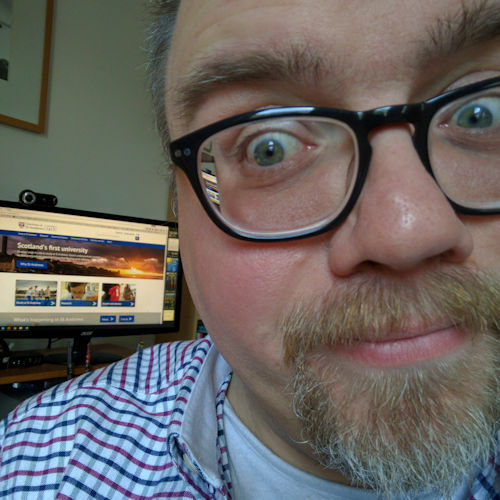 In celebration of the really terrible photos I found — which now fill two and a half mini albums of their own — I’ve started a new blog to share them with the world: My rubbish photos. Surely the bigger issue is how much your mum looks like Jane in that photo! Thanks Ross for making a nice post where I was able to share something of my childhood feel … kinda weird and wrong! The thing is I don’t see it myself, although they do say that “men marry their mothers”. At the end of the day, I love Jane and I love my Mum, so that’s all that matters really. to be honest, I can’t see the likeness with Jane. I see the resemblance though – and I’m Jane’s mother. I should know better.